Acrylic on canvas and eyelets, 215,5×299,5 cm. Donald Urquhart (1963), born in Dumfries, Scotland. Lives and works in London (UK). A key member of the performance art and drag scene in 1980’s London, Scottish artist Donald Urquhart’s work began as flyers, posters and wall decorations for “The Beautiful Bend”, an exuberantly camp club night that he co-founder in the early 1990’s. His ink drawings celebrate the faded glamour and dark histories of Hollywood sirens with black humour and pristine graphic skill. 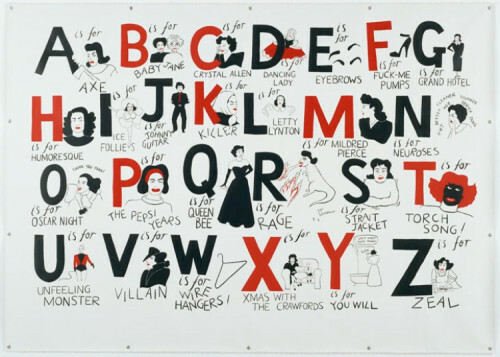 The artist describes A Joan Crawford Alphabet as ‘an obituary in 26 parts’. A textual and visual picture of the starlet’s life is brought forth in illustrated red and black letters, touching on her film roles – ‘L is for Letty Lynton’ – as much as the darker features of her personal life. After her death in 1977, Crawford’s egoism, alcoholism, mental illness, and child abuse were damningly portrayed in a biography penned by her daughter: Urquhart doesn’t flinch from these elements. ‘R is for Rage,’ sees her as a fire-breathing ‘Joanzilla’, while ‘Xmas with the Crawford’ depicts her sat grimacing on a sofa next to two miserable-looking children. In ‘A is for Axe,’ the actress has hacked into the letter itself with her weapon, as if pursuing Urquhart from beyond the grave. The artist’s wit is razor-sharp, revealing the roles played by Crawford on and off screen in a complex compound portrait.